In our current modern world of advanced technology, powerful machines, and fast-paced life, tool sets are an invaluable asset to everyone. Even if you don’t own a home or a car, more than likely you’re going to need some sort of tool for some small repair at one point or another in your life. 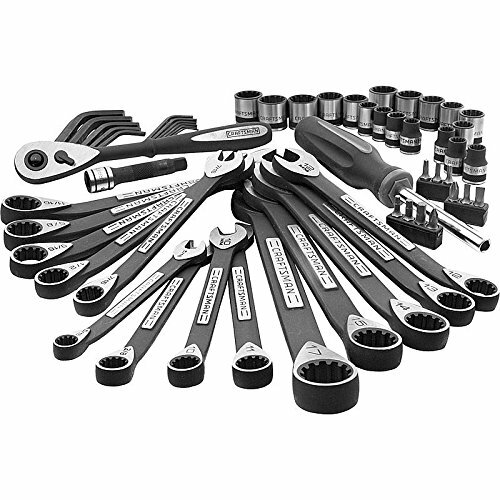 Ratchet sets are some of the most useful tool kits available, primarily due to the huge range of potential mechanical issues that can be solved with them. 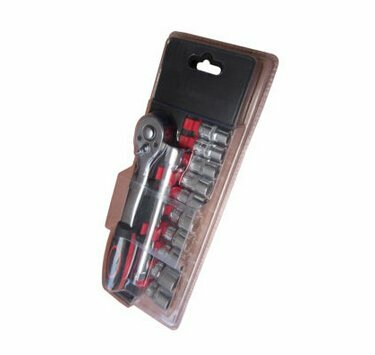 Ratchet sets make great starter tool kits because they usually include a wide variety of ratchet socket sizes, and many also provide several other common tools as well, like a pair of screwdrivers or a wrench. The following is a brief outline of the ten best ratchet sets currently on the market in 2018. 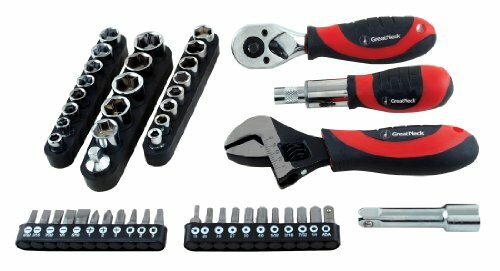 This tool set by Craftsman will prepare you to fix a wide range of mechanical issues. It has everything you need to replace or tighten just about any size bolt, and the set comes in a durable yet lightweight plastic case. 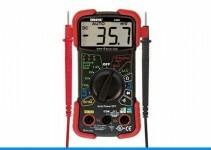 This set is classified as universal because it not only comes with standard socket sizes, but it also includes several metric sockets for non-English systems. Each tool in the kit is coated with a black oxide finish to provide the strongest grip possible, and the proprietary quick release ratchet makes switching out the sockets simple and fast. 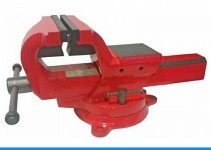 The ratchet only requires 8 degrees of rotation, so it can easily fit in the tightest spaces. 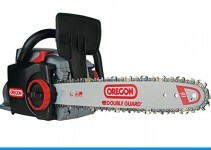 A lifetime warranty is included as well. 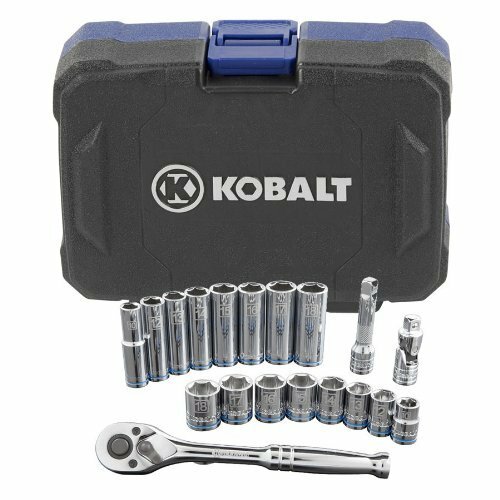 This high quality set by Kobalt features chrome vanadium steel tools that offer unmatched power, durability, and torque. The 19 included metric instruments are finished with a smooth, professional grade polish, and the protective carrying case is made from a hardshell plastic with a locking mechanism. The ratchet employs 72 teeth for the strongest rotational power possible, and it only requires 5 degrees of movement for optimal operation. The kit includes 6 standard metric sockets, 6 deep metric sockets, a 3 inch extender, and a universal adapter piece. This affordable kit is the perfect addition to any tool collection, or a great starter kit for those just being their collection. Since 1919, GreatNeck has manufactured premium hand tools that deliver functionally utility through optimal design and durable materials. This 50 piece set includes a ratcheting screwdriver, a standard stubbed ratchet handle with 22 socket attachments, an extender for the ratchet handle, and a fully adjustable wrench. The attachment pieces are rated for metric and standard use, meaning they will fit nearly any bolt size. Each hand tool comes with a sure-grip handle, complete with a rubber comfort strip. This kit doesn’t come with a dedicated carrying case, but the components are easily added to an existing tool box. GreatNeck offers a lifetime warranty on all their products for both material and manufacturing flaws. 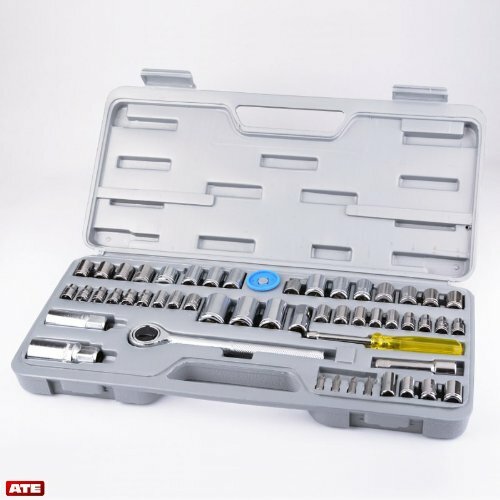 This amazing set by ATD utilizes lower profiles than most other ratchet sets, meaning it can reach places typically inaccessible by other instruments, even those with extension bars. Each piece is plated with a chrome finish that provides additional shine and durability, and the internal steel structure gives the strength necessary to perform even the hardest tasks. You won’t have to worry about not having the appropriate piece with the ATD Tool Kit, since it comes with both standard SAE (Society of Automotive Engineers) and metric components. A molded plastic storage case is used to house the kit when not in use, which makes portability a breeze. This kit is ideal for those with exceptionally hard to reach bolts. When you need professional grade equipment and variety, the Pittsburgh Professional 301 Piece Kit is the perfect option. This massive kit has both SAE and metric tools, so you can work on any system you encounter. It includes a plethora of unusual socket sizes, including star, square, and those specifically designed for spark plugs. There are several included accessibility components, including several extender bars, universal joint adapters, and multiple ratchet handles. 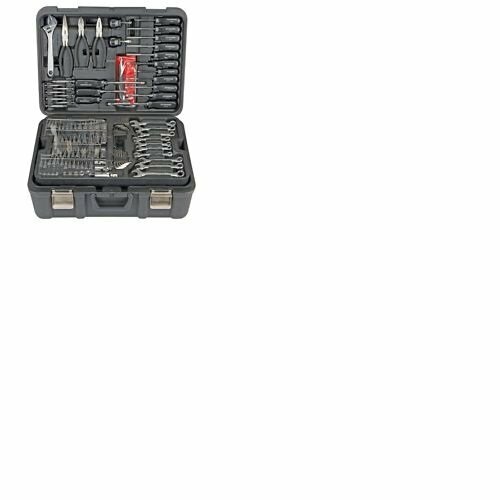 Each piece is made from the strongest chrome vanadium steel, and the durable storage case perfectly organizes each tool into its appropriate location. This impressive kit also includes a set of screwdrivers and 26 Allen wrenches of varying sizes. The Aumo-mate Tool Set provides everything you need to get your home or automotive job done. The price of this kit is very affordable compared to some of the larger, more complex kits, and it has just as much versatility as those expensive brands. An included carrying case makes organization and storage both simple and convenient. The lifetime guarantee promises that your tools will last for as long as possible, and the heavy-duty chrome vanadium design of each piece promotes strength and durability. Ergonomic handles make each tool easy to grip, so slipping will be a thing of the past. The ratchet handle comes with several extenders for those hard to reach places, and the quick release mechanism makes speedy repairs a breeze. The ATE Pro Kit is one of the most efficient yet simple kits available today. It comes with two ratchet handles, each designed for a specific purpose. Both handles are reversible for the ultimate utility, and an included extension bar helps you reach those tight spaces in your engine. The kit uses only SAE sizes, which is ideal for those who exclusively work on American made systems. A universal male/female adapter makes it easy to finish any job without having to seek out additional tools. The kit comes with a clamshell plastic case for maximum portability, and its compact profile allows for storage in just about any spare space. 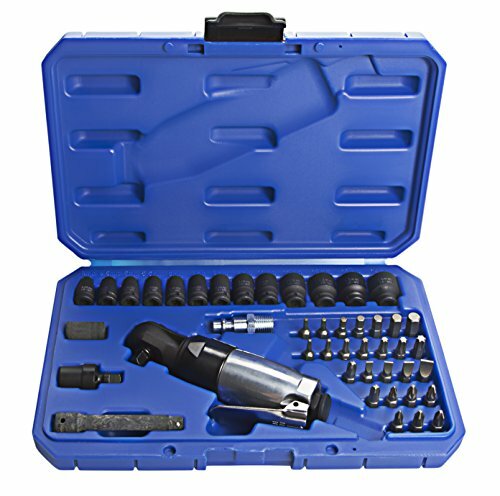 This generic brand socket set is ideal for small jobs that need to be handled quickly and efficiently. The small kit has a plastic storage pouch that fits easily in most back pockets or tool belts, and it can safely be stored in a tool box when not in use. It’s made from high-quality materials, and the durable design promises to provide years of satisfaction. The kit includes ten socket attachments ranging from 10mm to 19mm, and an extension bar makes it easy to reach even the toughest places. A small plastic rail is included to keep the sockets organized. This kit is perfect for those who don’t need a full ratchet set, but still need the basic necessities from time to time. Not all ratchet sets are made to be manually operated. The Steelman Mini Air Ratchet Kit is one such product, and it functions by using compressed air to create intense rotational power. The pneumatic design provides up to 350 RPMs with a max torque of 20 ft-lbs, which will burn through tasks nearly as fast as you can move between them. The lightweight construction is ideal for travel, and the included screwdriver heads make this air ratchet much more versatile than many other similar products. The included bits come in several varieties, including hex, standard, and star shaped. The pneumatic handle weighs less than one pound for maximum dexterity, and the plastic carrying case protects against wear and tear when not in use. A simple quick release handle allows for fine control of the air flow into the device, making the overall user experience much more efficient. If you need maximum torque with minimal effort, then the Stanley FatMax Kit is for you. It features a 3/8 inch ratchet drive that provides solid rotational power that won’t slip or catch. Each socket attachment is laser etched for the most stable connection possible, and the kit comes with a 28 piece Allen wrench set. 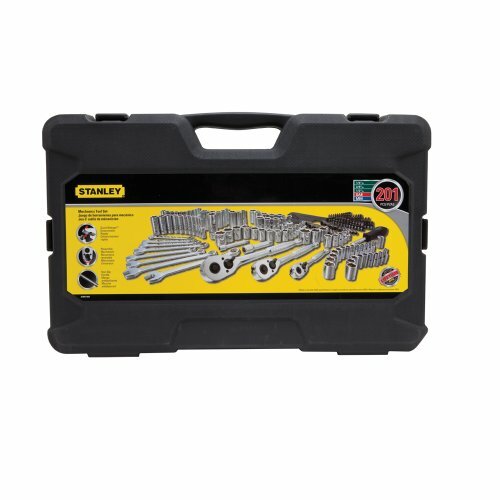 The Stanley FatMax set is sold in a durable plastic case with clamping lid hinges, and the interior of the case offers organization and protection from vibration and general deterioration. This kit follows in the footsteps of the rest of the Stanley family, providing premium hand tools that are simple to use, ergonomically correct, and powerful.